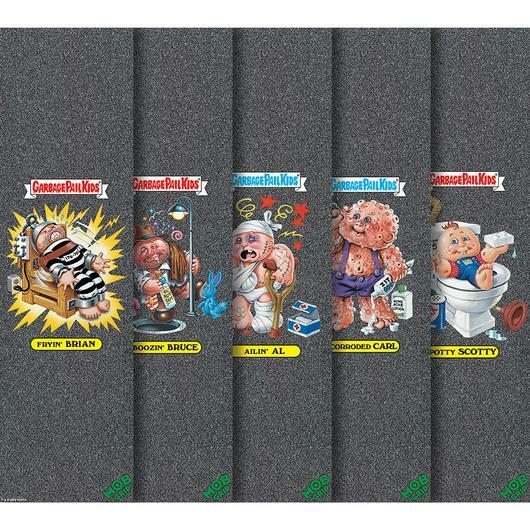 After being quiet on the market for the last six months, Mob Grip is returning with a new selection of Garbage Pail Kids skateboard grip tape. 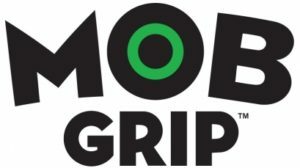 Mob Grip is a subsidiary of NFS, Inc. The same company that owns Santa Cruz skateboards. Last October Mob Grip launched their first wave of GPK character grip tape. The company is returning this summer with new styles and new characters. Mob Grip is offering two styles of tape. The first features GPK characters on a black background. The characters offered are Fryin’ Brian, Boozin’ Bruce, Ailin’ Al, Corroded Carl, and Potty Scotty. The Bruce is a repeat character from their first offer back in October, while the others are new. 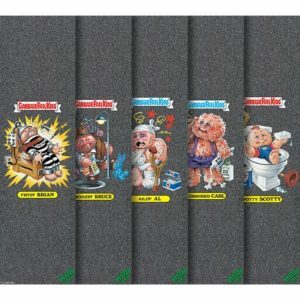 The second group being offered is GPK characters on clear grip tape. Adam Bomb, Tee-Vee Stevie, Mad Mike, Wacky Jackie, Bony Joanie are the five characters being offered in clear. Both Adam and Stevie are repeat characters from their first offer. The tape measures 9″ x 33″. Right now The Dark Slide online skateboard company is offering the grip tape for pre-order. They currently have both sets of grip tape available as a 5 pack for $59.99. The tape should be available for pre-order soon at many skateboard shops. The last batch of grip tape retailed for $11.99 each. According to The Dark Slide’s website the tape is scheduled to launch in July of this year. This entry was posted in Skateboards, Topps Licensed and tagged Skateboards, Topps Licensed by Jeff. Bookmark the permalink.